It’s true that TV shows are the new black. Not that you need a TV to watch them anymore of course, but you catch our drift. There is now fluidity for actors between ‘TV’ and film like never before, with many effortlessly switching back and forth. There are still some curious anomalies however. There have been some huge characters on the small screen, who although have appeared in big screen offerings, just haven’t had the same kind of impact. An example would be Lost with its love triangle between Jack (Matthew Fox), Kate (Evangeline Lilly) and Sawyer (Josh Holloway), which enthralled audiences over six seasons. And although all three actors who played them have made it onto the big screen, none have become huge A listers. The same could be said of Breaking Bad's Bryan Cranston and Aaron Paul, and the entire cast of Game of thrones. And with the announcement of the departure of Andrew Lincoln, of The Walking Dead fame, it will be curious to see where he drifts off to. Jon Hamm though, can definitely be added to that list. Maybe it’s because he - as well as all those previously mentioned - did such a magnificent job in their respective shows, that it’s difficult to shake them off. Here then, Hamm once again does his best to step out of Don Draper’s shadow, in this political thriller. And I thought this was the bar where everyone knew your name?! The capital of Lebanon is Beirut, one of the oldest – and most troubled - cities in the world. In 1972, US diplomat Mason Skiles (Hamm), and his Lebanese wife, found themselves living in the city, and caring for a young Palestinian boy, Karim, who has no family. During one of their working get togethers though, Mason is informed by his CIA friend Cal (Mark Pellegrino) that the boy actually has a brother, who just so happens to be a known terrorist. Just as Mason attempts to comes to terms with this news, tragedy strikes, changing Mason’s life forever. Ten years on and Mason, back in the USA, is an alcoholic in a dead-end job as a labour mediator. Out of the blue, an old client gets in touch, telling him that the agency is once again in need of his services. A US citizen has been kidnapped, and the kidnappers have asked for him by name to negotiate. Mason tells them he’s not interested, but when he’s told that it’s his old pal Cal that’s been taken, Mason changes his mind, and soon finds himself on a plane being pulled back into a city that he’d sooner rather forget. I'm afraid Jon, the situation is bad. Apparently jackets are outlawed here. There’s certainly an irony regarding Brad Anderson helming this effort; his bread and butter work over the years has been in directing TV shows, including episodes of Homicide: Life on the Streets, The Wire, Fringe and Boardwalk Empire. So, much like Hamm, he probably feels that he has to step it up a gear or three for the big screen. And, for the most part, the pair do just that. They are certainly aided by the fact that he is suited throughout, and as everyone knows, no-one looks as good in a suit as Hamm. No, not even Daniel Craig. 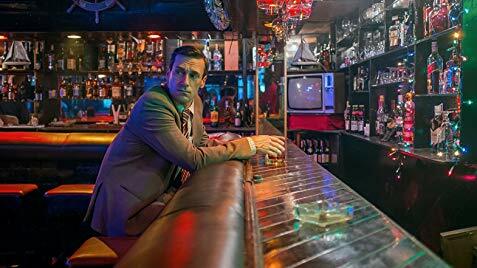 But wardrobe aside, Hamm gives a strong performance as Mason; the character is undoubtedly qualified for the job at hand, but due to his past, he’d rather be anywhere but there. There are also solid supporting roles for the likes of Rosamund Pike, Shea Whigham, and the normally bald Dean Norris (Breaking Bad's Hank), sporting a surprisingly fine head of hair. Anderson does a great job too; his direction is taught, and he really gets under the skin of the city, with a suitably period feel. The film has a snappy pace about it too, that just falls short of edge of your set stuff. One criticism that could be fairly levelled at it is its predictability and lack of originality. Often there are scenes that have a heavy whiff of déjà vu about them, and it’s this familiarity that sadly softens the film’s impact. It won’t catapult Hamm onto the big screen A list, but it doesn’t stop him from being highly watchable yet again, in this compelling thriller.